When you find yourself slogging through forums, YouTube comments and the bases of inflammatory articles surrounding the brand new gaming consoles, it can be hard to remember that there are unique people with personalities behind each machine and their offerings. It's nice, then, when one of those people pipes up with something more human than PR. We've seen it a lot lately with Sony's Shuhei Yoshida as he's complimented Nintendo a few times. Now? It's Phil Spencer's turn. 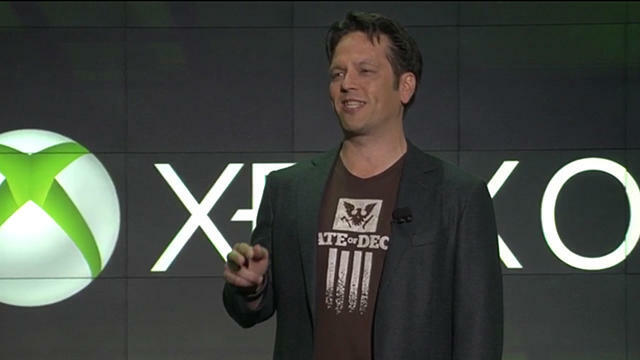 Spencer is the Corporate Vice President of Microsoft Studios. In an interview with OXM UK, this Xbox executive had kind words for both sources of his console's competition. Let's start with Sony. Spencer loves what they've done with their first party efforts. "Sony – and I'm focused on first-party because of what I do – I really respect their focus on investing in new things and creative things, what they've done with David Cage and Quantic Dream around Beyond [Two Souls] and Heavy Rain; they stay committed to franchises even if they don't sell 10 million units, they'll stay committed to things. I think that long-term commitment to franchises is important, where it's easy to pull off the Band-Aid and move onto the next thing [if it doesn't sell]. I respect their 'stick-to-it-iveness'. I'll say, they've done a nice job with PS4 […] When I think about their announcement, their clear focus on a customer, leading with the value proposition of what they're trying to do, staying true to a vision, I think they've done a nice job in how they defined the PS4." As for Nintendo? Spencer stuck with the first party theme, this time heaping love on Nintendo's internal efforts. "Nintendo, I think – and there's some argument about this – that their first-party is such an amazing asset…Their first party studios and IP can lead what they do as a company and the platforms are almost in service to the IP – not in a bad way. They have such iconic stories and this will seem somewhat random, but when we go back and do something like Killer Instinct, a little bit of the history of your franchise can actually be important part of people feeling connected. Obviously the history of Killer Instinct isn't a history on Xbox, but it's Rare's history and I think the reaction when we announced it on-stage at E3 showed that playing to the people's heart, I think Nintendo does that as well as anybody in terms of hitting the franchises and having huge success with them." What do you think? Will Spencer and Microsoft take inspiration from their competition and grind out some incredible first party efforts for the Xbox One? We hope so.